Welcome to Fabulous Hutch Ten. This home is privately nessled in the trees, yet located just steps from restaurants and shopping in the quaint Bavarian-style village. Enjoy breathtaking views and sunsets overlooking the mountain from the wrap-around balcony of this home. Most are attracted to Snowshoe for the unlimited winter activities. There are 57 trails for you skiing pleasure or snowboarding on the terrain park, snowmobiling, tubing, cross coutry skiing, and so much more. But Snowshoe is now a year round destination offering mountain biking, hiking, and weekend activities for spring, summer and fall. Play golf at the Gary Player designed Raven Golf Course, voted #1 Public Access Golf Course in West Virginia for the fourth year ina row.There is something for everyone at Snowshoe! Although Snowshoe Mountain is know for being one of the best Ski Resorts on the East Coast, there is so much else to do throughout the rest of the year.In the summer, there is mountain biking, hiking, swimming, golf and so much more. The Greenbrier trail is just down the mountain to Cass, WV. It was an old railroad track that was turned to a 20 mile bike, hike or horsebackriding trail. Cass Railroad is a one of the last steam locomotive trains that take you on an 11 mile ride through beautiful WV mountains. Raven Golf Club, The Gary Player Signature Raven Golf Club at Snowshoe Mountain Resort provides an impeccable course with gorgeous scenery every step of the way. Long fairways take advantage of the rolling terrain, some dropping as much as 200 feet from tee to landing. Please visit www.snowshoemtn.com website for information about so much more to do there. Our 3 story Hutch is beautifully decorated with lots of charm & care to make your stay enjoyable. When you walk in through the bottom floor, you enter a 'mud' room perfect for putting on & taking off, and storing your ski gear in a warm safe place. This is also where the full size 'new' W/D is located. You will then enter a door into the bottom level Master Suite. It is a perfect place for privacy to get away from the rest of the house, if need be. This room has a King size bed, a full desk with a phone line for computer hook up & a fax machine. There is a fireplace for romance & to warm up those chilly nights! The master bath on this level has a shower. The middle level has a wrap around balcony for viewing those fabulous sunsets, the gorgeous views & the wildlife, deer, rabbits & even an occasional bear! On this level is another master bedroom with a queen sized bed & a private bathroom w/ a tub. The second bedroom on this level has a full sized bed and a back entrance to the 3rd bath. The newly renovated kitchen is fully equipped with Hickory cabinets, dishwasher, microwave & double door refrigerator w/ water & ice-maker in the door. The dining room table has leaves & can seat 10. The living area faces the fireplace & overlooks the view down the mountain. All bedrooms & living room have TV's & DVD players & the house is hooked to Satelite TV. The loft has 2 twin beds. After you park right in front of the Hutch, in our private parking area, you never really have to get back in your car again until you depart. The Snowshoe shuttle service stops approx 50 yards from the Hutch & provides free transportation to anywhere from the very top of the mountain, to the Village & into Silver Creek. You can ski from that same area on the Cupp, Shay's slopes(black & double black), or the other side where there are green & blue slopes. The lifts come up at that same area. Or you may choose to walk a 5-10 minute walk down a plowed lit path to the Village. As many of you know, Snowshoe has expanded it's terrain for this season. Two new trails have been developed, both of which will be accessed by the new Soaring Eagle Express. The new slopes have increased the total number of Snowshoe's ski trails to 59. There is also good news for Cupp Run and Shay's, if you haven't heard. There is a midway station under construction right now, which was how Cupp Run was originally set up. This will enable Snowshoe to open Cupp and Shay's early season, as they only have to make snow to the mid station, and will open the lower half when the cold weather supports snowmaking on the entire mountain. They have also enhanced their capability to make snow on these upper slopes with new equipment. 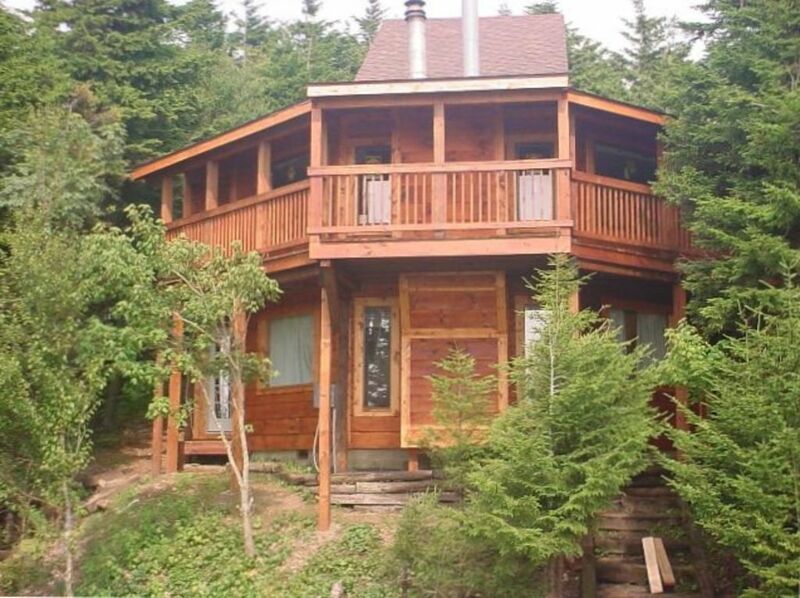 The wrap around balcony is a perfect place to enjoy the beautiful view, sunsets & wildlife. You'll see deer & even an occasional bear passing by! Very close to everything including lifts. I appreciate your review. Interesting to note, after you left, the cleaning crew discovered a broken cold water line below the downstairs bathroom. That was most likely the reason the toilet did not flush and the reason for not being able to get the water temperatures right. Always, as in our checkin instructions, contact management, or myself the owner, when things are not right, we would have discovered the problem earlier and corrected it. As far as room temperatures. each room has its own temperature controls. We find that we need to turn the temp off completely on the top floor and higher on the bottom floor as heat rises. Nevertheless, we stress to make each guest comfortable for their stay, and will continue to make improvements and necessary repairs to achieve that goal. This was such a fun and comfortable stay for us! We had the sweetest Spring Break and will cherish the memories in Hutch 10 forever. The location is fantastic, and the facility is cozy. Thank you for such a fun time! Please note in response to the Review above. All of the reviews to now have always been 5 stars or good reviews and all suggestions for problems or suggested repairs needed have been dealt with immediately. In this case, this guest notified me at 3:00 pm on Saturday, the night before they left that the oven was not working, the microwave was not working and the tv was not working. I contacted our maintenance man, as well as gave the guest his information to call as well. George told them he would be there by 6:00 pm. George found while he was there that the guests had melted something plastic on the oven unit, which shorted it out. The guest said they did not do it, but admitted they had used the oven the night before, and it worked then, and the plastic was not on the oven when the unit was cleaned prior to their arrival. The pull out sofa bed was bent and broken and would not go back in. It could only be bent so severely by someone jumping on it. The guest said they didn't do it, but it was not like that for the previous guest. At that we have had the metal bent back, but the integrity is bad and cannot be fixed back right. The bed in the loft was also broken and the slat under the bed needed to be replaced. The electric was surging and we had a hard time figuring out why. These guests checked out the next morning, (Late checkout at that). The electrical surges burned out the motor in the refrigerator and I did need to get a new refrigerator delivered the next morning. It was found that the electrical problems were caused by something getting caught in the garbage disposal, while it kept trying to run, got hot and caused surges in the electrical system. I do not blame someone for that issue, I am not sure that was something that was done purposely, but all of the other issues were blatant disregard of our property. As far as their food being spoiled... the refrigerator did not start getting warm until Saturday night, we had another small refrigerator downstairs and the temp outside was below freezing, there should have been no reason to lose any food. There also was another small microwave downstairs as well. One more thing... our agreement strictly states that the Hutch holds 10 guests. I am told that our maintenance man did not count, but he was pretty clear there was more than 10 guests staying. Electric panel has been replaced. Final word... we have rented this Hutch now for 15 years and have never held anyone's deposit before. The hutch is nicely decorated, and it seems that the owners are trying to make it as welcoming as possible. Some small improvements should make this place awesome. This house has enough place for up to 3 couples. The property was excellent and was everything and more we hoped it would be. We travelled up with family we had stayed with over Christmas for a skiing holiday. The majority of us were first time skiers and snowshoe was the perfect place for us. The lodge had all the amenities needed and after a long day skiing the boot room for drying clothes and the wood fire to warm ourselves were the icing on the cake. The bus stop for the resort bus being so close also meant that we didn’t need to keep moving the cars. Would definitely recommend this house to anyone and hope that now we have all got the bug for skiing will be able to return.